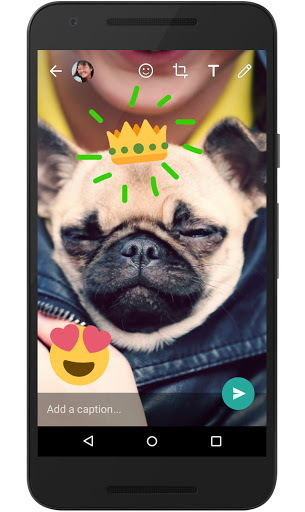 WhatsApp has brought its new image doodling feature from the beta version of its chat app to the pubic Android release, with iOS support coming soon. and videos, as well as add emoji to express yourself. a thousand words. Try adding text too, and change the color and font style. cameras, double tap on the screen. While both Facebook Messenger and WhatsApp both have more than 1 billion monthly active users, far more than Snapchat, Spiegel’s company still poses a kind of existential threat. That’s both because of Snapchat’s growth and the company’s philosophy of sharing rougher, on-the-spot images and videos not designed for posterity — in other words, content that won’t live on in Facebook’s collective memory. In turn, Facebook has been forced to introduce features more popular with younger smartphone owners, even as they go against its more traditional aesthetics. Key among those additions have been doodling, text, and emoji editing tools, which are now a mainstay in pretty much every messaging app available.